I definitely cook a lot less now that I more or less live in a hotel. But once in a while I do whip something up. 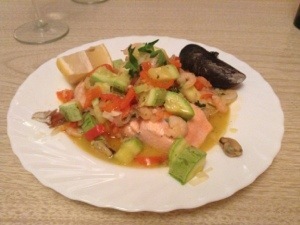 Here is a delicious dinner of trout I made the other day, with a topping of shrimp, mussels, peppers, and zucchini. The fish at the Mercado Central is very good and I am delighted to know where to get good fish in this rather meat centric country. This entry was posted in Norsk i Argentina, Norway in Argentina, Personal. Bookmark the permalink. I am a norwegian who lives in the Canary Island. I`m not good in cooking, and it is difficult to understand what everything is here, need to learn spanish better;) It is a lot of people fro Argentina at this Island, and I would like to get to know Argentina better as a country:) Enjoy! Hei Elisabeth, tusen takk for kommentar! Yes, learning the names of different fish, and understanding all the different varieties available takes some time, but it is fun! Say hi to your Argentine friends!